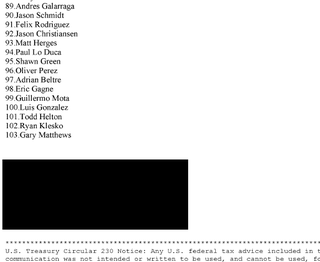 Yesterday, RotoInfo posted this widely forwarded "rumored 2003 Steroid list," which purported to enumerate the 104 players who flunked baseball's anonymous round of drug testing that year. Don't believe a word of it. In an e-mail, RotoInfo insisted that the names come from a "trusted source." Maybe so, but the problems with the list are plain to see. For one thing, Jason Grimsley's name is absent. Grimsley, you'll recall, has been confirmed as one of the Juicin' 104. You may also notice that the list now stands at 103 names. That's because, as RotoInfo told me, Jeromy Burnitz's name initially appeared twice. Sorry we haven't called you personally. This story is generating some buzz. The list is a rumor and unconfirmed. We stressed that in the article. Its a trusted source, that's why we didn't hesitate to post it. When we receive more details, you will be the first to know; we will gladly share everything with you. As we state in the in the article, its unconfirmed and a rumor. Grimsleys name isnt on there because of give or take a few names. The one thing i did notice at first was burnitz name was on there twice. We removed one, maybe one of them was suppose to be Grimsleys. Were receiving alot of negative feed back especially from Red sox fans. Which leads me to believe this list is 90% accurate. Someone sent me an email regarding KROD on the list. My answer was 2 years ago he was throwing 98 99, now he has a change up and is throwing 92 to 94. lol. As for my source, its a trusted one, thats all ill say. Im sure you understand. Ill update you accordingly if any more of this story comes our way. Were a fantasy site, we could actually care less about this stuff, didnt think it would generate this much buzz. Thought we would give some users on our site something to talk about. An ungenerous reader might idly speculate that the site's sources are all full of crap. The whole lot of them. Give or take a few.